US President Barack Obama, on his first trip to sub-Saharan Africa since taking office, has said Africa must take charge of its own destiny in the world. Mr Obama told parliament in Ghana during his one-day stay that good governance was vital for development. Major challenges awaited Africans in the new century, he said, but vowed that the US would help the continent. The US president’s trip comes at the end of a summit of eight of the world’s most powerful nations, held in Italy. 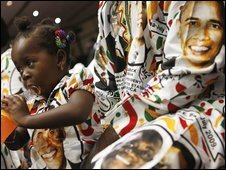 Ghana was chosen as the destination for the president’s visit because of its strong democratic record. Mr Obama headed from parliament to Cape Coast Castle, a seaside fortress converted to the slave trade by the British in the 17th Century. He was accompanied by his wife, Michelle, a descendant of African slaves, and both of his young daughters. People crowded into a public area outside the fort to greet Mr Obama, with those unable to get a place in the throng climbing onto nearby roofs and filling balconies just to catch a glimpse of the US leader. Mr Obama spoke to parliament shortly after a breakfast meeting with Ghanaian President John Atta Mills. He wore a broad grin as he was greeted at the podium by a series of rousing horn blasts from within the chamber. “Congress needs one of them,” Mr Obama joked, before turning to more serious matters. 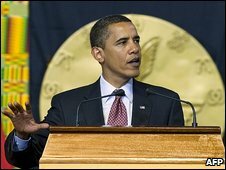 Delivering a message that “Africa’s future is up to Africans”, Mr Obama conceded that the legacy of colonialism had helped breed conflict on the continent. “But the West is not responsible for the destruction of the Zimbabwean economy over the last decade, or wars in which children are enlisted as combatants,” he added. He praised Ghana’s own progress, governance and economic growth, saying Ghana’s achievements were less dramatic than the liberation struggles of the 20th Century but would ultimately be more significant. “Development depends upon good governance,” Mr Obama told legislators. “That is the ingredient which has been missing in far too many places, for far too long. Expanding on his message, Mr Obama said four key areas were critical to the future of Africa and of the entire developing world, citing democracy, opportunity, health and the peaceful resolution of conflict. The speech has gone down extremely well. This is a country that has been enormously proud to play host to Mr Obama and referred to him as a brother. People say endlessly that he is part of the family and they are expecting a great deal of him. It was a very broad-ranging speech but Mr Obama has an ability because of his heritage, his Kenyan father, to reach out and speak to Africans in a way that I think most foreign leaders would find very difficult. There are very few barriers for Mr Obama in this conversation that he is trying to initiate with Africans and I think that this speech will have ticked many, many boxes. This is Mr Obama trying to link Africa into the international community. He hailed Ghana’s democratic society, calling for strong parliaments, honest police, independent judges and a free press across Africa. However, there were some blunt words directed at other countries, many of which have been undermined by despotic leaders and corrupt politicians. “Africa doesn’t need strongmen, it needs strong institutions,” Mr Obama told his audience. He pledged to continue strong US support for public healthcare initiatives in Africa, and called for sensible use of natural resources such as oil in the face of the threat of climate change. “Africa is not the crude caricature of a continent at war,” Mr Obama added. “But for far too many Africans, conflict is a part of life, as constant as the sun. He described wars as a “millstone around Africa’s neck”. “You have the power to hold your leaders accountable, and to build institutions that serve the people,” Mr Obama said, describing freedom as Africa’s “inheritance” and urging the continent to beat disease, end conflict and bring long-lasting change. In an echo of his presidential election campaign, he drew his speech to a close with a version of his trademark slogan: “Yes you can,” he told the gathered legislators. On the streets of Accra, many billboards welcoming Barack Obama have been erected, including one showing an image of the president and wife with the words: “Ghana loves you”. People have poured into Accra for a glimpse of the president during his 24-hour stay in Ghana. But security is tight for the president’s visit, and few ordinary Ghanaians will have the chance to glimpse the first African-American President of the United States. Mr Obama arrived in the capital late on Friday, fresh from the G8 summit in Italy where heads of state agreed on a $20bn (£12.3bn) fund to bolster agriculture – the main source of income for many sub-Saharan Africans. Iranian riot police are reported to have clashed with demonstrators defying government decrees to stop street protests over disputed elections. Eyewitness reports say there have been clashes near the parliament building in the capital Tehran, in the streets around Baharestan Square. Reporting restrictions in Iran mean the we cannot verify the reports. The new protests came hours after Iran’s supreme leader said it would “not yield” over the election result. Ayatollah Ali Khamenei again said the result would stand, despite days of protests in which at least 17 people are reported to have died. The ayatollah has repeatedly demanded that the protests stop, but his calls have gone largely unheeded. Witnesses told the Associated Press that police beat protesters with batons, fired tear gas and shot into the air to disperse the crowd on Wednesday. 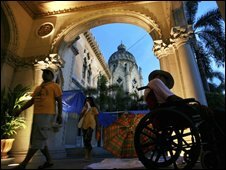 Although some demonstrators fought police, others fled to another square about a mile (2 km) to the north, the witnesses said. The main protest leader, former prime minister Mir Hossein Mousavi, has not been seen in public for days, but his website quoted his wife saying protests would continue. Since this was the first time in almost one and a half centuries that a French president had been allowed to address parliament, President Nicolas Sarkozy’s speech was already on course to ruffle a few feathers. The Greens and Communists refused to attend and the Socialists left early, claiming the venue for the address – the Chateau of Versailles, which was home to King Louis XIV – smacked of monarchy and a thirst for power. But it was the French leader’s attack on the burka that really caused a stir. He expressed his strong distaste for the head-to-toe Islamic veil, calling it not a sign of religion but a sign of subservience. They are in response to a call last week by a group of 65 cross-party MPs, led by the Communist Andre Gerin, who wants a parliamentary commission set up to investigate the spread of the burka in France. 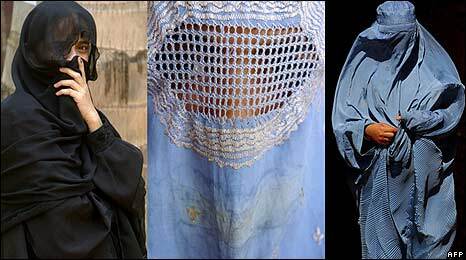 They want to see whether such a spread is indicative of a radicalisation of Islam, whether women are being forced to cover themselves or are doing so voluntarily, and whether wearing the burka undermines French secularism. Mr Gerin believes the burka “amounts to a breach of individual freedom on our national territory”. Because, if the mention of monarchy triggers warning bells in France, the mention of religion triggers much louder ones. The concept of secularism or “laicite” is sacred in France. The separation of church and state is jealously guarded by everyone from school teachers to government ministers – and the constitution states the republic “does not recognise, subsidise or remunerate any religious body”. It underpinned the French Revolution, and has been a basic tenet of the country’s progressive thought since the 18th century when French Enlightenment thinkers like Voltaire, Diderot and Montesquieu regarded religion as divisive, benighted and intolerant. It was this same concept that was invoked five years ago to ban conspicuous signs of religion – including Islamic headscarves – from schools. 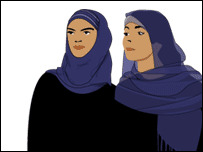 That decision sparked controversy and debate across Europe, with critics claiming it stigmatised Muslims at a time when France needed to be stepping up its fight against rife discrimination in the job market, which had caused so many youths of Muslim origin to feel forgotten by French society. This latest call for a potential ban of the burka has prompted the head of the French Council for the Muslim Religion to warn MPs they risk stigmatising Muslims again. But the special inquiry does have the backing of Dalil Boubakeur, rector of the Paris Mosque and a former head of the Muslim council, who insists that Islam in France should be an “open and convivial Islam that allows people to live side by side”. He fears that anecdotal evidence that more women are wearing the burka in France is linked to an “excess, a radicalisation” among some Muslims. With five million Muslims living here, France is home to Western Europe’s largest Islamic community and the government will be anxious not to isolate the Muslim population by being seen to be trying to dictate to women what they should wear. The issue has even split the French cabinet. Rama Yade, the Muslim human rights minister, said she would be open to a ban if it was aimed at protecting women who wore a burka against their will. The immigration minister, Eric Besson, believes a ban will only create tensions. 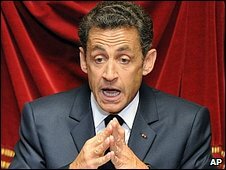 President Sarkozy may have given his backing to an open debate on the burka, but he also insisted France needed to make sure it knew exactly what it was debating. Thailand’s ruling party has dropped ousted PM Samak Sundaravej as its nominee for the job, say party sources. The decision marks an apparent U-turn by the People’s Power Party (PPP), which earlier seemed determined to re-nominate him to the post. Protesters have been demanding for weeks that Mr Samak should resign. The apparent confirmation that he is no longer in contention for the post may pave the way for a settlement of the political crisis, analysts say. Mr Samak had vowed not to bow to the protesters’ demands, but was eventually forced out earlier this week, over an apparently unrelated appearance in a TV cookery show. The protesters call him a puppet for former Prime Minister Thaksin Shinawatra, who was ousted in an army coup in 2006 amid accusations of corruption and abuse of power. Reports are confused as to whether the pressure to drop Mr Samak came from within the ruling party or from its five coalition partners. The Associated Press news agency quoted PPP spokesman Kuthep Kuthep Saikrajang as saying the party had short-listed three party members as its prime ministerial nominee, though they were not named. The party will need to agree on a compromise candidate before Wednesday, when parliament has scheduled a new vote for prime minister. Earlier on Friday, a planned vote in the Thai parliament to re-elect Mr Samak as prime minister was postponed because too few MPs turned up. Thousands of protesters who have been holding a sit-in outside Government House calling for Mr Samak’s resignation were enraged by his re-nomination. Protesters pledged to continue their protest until a suitable replacement for Mr Samak was found – a scenario which may now have materialized, say correspondents. Although the PPP is the largest party in parliament, it does not have an outright majority and four of its five coalition partners had already said they wanted an alternative candidate. On top of that, Mr Samak also faces disqualification again later this month if the verdict in a defamation case goes against him. 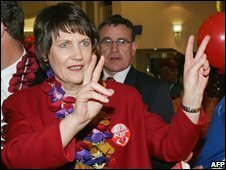 New Zealand Prime Minister Helen Clark has called a general election for 8 November, aiming to win a fourth term in office. However, Ms Clark’s Labor Party has trailed the opposition National Party in opinion polls for the past year. Economic woes and a scandal-hit foreign minister have given the opposition its best chance of power in a decade. But the country’s aversion to the Iraq war and strong anti-nuclear stance are unlikely to change, whoever wins. Ms Clark, 58, a successful campaigner, told a news conference on Friday that the election would be about trust. “It is about which leader and which major party we New Zealanders trust our families’ and country’s future with,” said the prime minister. “What I see is that as the election nears people are focusing very much on what the real choice is. And at that point it comes down to what matters most to our families and our communities,” she said. The latest date on which elections could have been set was 15 November, and some analysts have suggested Ms Clark’s choice of date will give her time to claw back support. Correspondents say the nation’s economy is expected to be a key issue in election. A recent cut in interest rates may help Labour, and promised tax cuts are due to take effect in October. Public opinion polls show the Labor Party trailing the main opposition National Party by at least 6.5 percentage points – an improvement on a 16-point gap earlier in the year. New Zealand’s voting system is mixed-member proportional representation, which shares power with smaller parties, in a 121-seat single-house parliament. Ms Clark’s government has led a minority parliament in recent years, relying on parties such as United Future and New Zealand First for support. New Zealand First leader, Winston Peters, has been her foreign minister but stepped down on 29 August as he is now under investigation for donations allegedly made to his party by wealthy business figures. Ms Clark has distanced herself from Mr Peters in recent weeks. Just before the election announcement, Ms Clark’s government passed a promised major piece of legislation to set up an emissions trading scheme. Parliament will be dissolved on 3 October and nomination day is 14 October, allowing for a five-week campaign period. “I do believe the future of New Zealand is at stake,” Ms Clark said. She said her Labor Party was “ambitious” for New Zealand, whereas the opposition party was “ambiguous”. National leader John Key did not immediately comment. Thailand’s political parties are meeting to discuss who should replace Prime Minister Samak Sundaravej, a day after he was stripped of office. 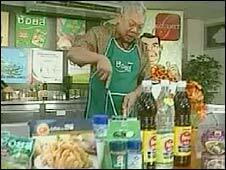 Mr Samak has not been seen since the Constitutional Court ruled he broke the law by appearing on a TV cookery show. Parliament is due to elect 73-year-old Mr Samak’s successor on Friday. His People Power Party (PPP), the biggest in the six-member coalition, appeared to back away from an earlier pledge to re-nominate him as PM. “What the party spokesman said yesterday was not the party’s resolution. Our resolution is the next prime minister must come from the People Power Party,” Reuters news agency quoted finance minister and PPP secretary general Surapong Suebwonglee as saying. Now that the dust has settled after the Constitutional Court’s astonishing decision on Tuesday, the bargaining has begun, according to the correspondent in Bangkok, Jonathan Head. Party factions have been holding meetings throughout the day; some have been in contact with the exiled former Prime Minister Thaksin Shinawatra, who is still influential because of his continued financial support. The PPP insists any replacement for Mr Samak must come from within its ranks, but its coalition partners are angling to get one of their own into the seat. 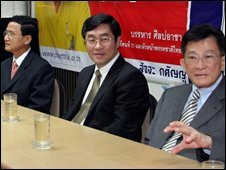 The second-largest of the partners, the Chart Thai Party, said the PPP should not re-nominate Mr Samak. But Chart Thai’s leader, Banharn Silpa-Archa – who as prime minister a decade ago presided over a currency collapse that triggered an Asian economic crisis – told Reuters he had ruled himself out. The opposition Democrats are proposing a new government of national unity as the best way out of the crisis – with the clear hint that their party leader should get the job. For the past two weeks, the Thai government has been paralysed by thousands of protesters who have occupied its headquarters, demanding Mr Samak quit. They accuse him of being a proxy for Mr Thaksin, who was ousted in an army coup in 2006 amid accusations of corruption and abuse of power. The demonstrators said they would continue to besiege Government House while waiting to see who parliament selects as the new prime minister. They have already warned that they will continue their protests if Mr Samak or anyone else closely associated with Mr Thaksin is chosen. The caretaker administration has anticipated the continued protests by proposing that ministers move their offices to the old international airport. Deputy PPP leader Somchai Wongsawat is acting as a caretaker prime minister until the new premier is named. Correspondents say his new role could fan Thailand’s political flames as he is the brother-in-law of Mr Thaksin. Somali MP Mohamed Osman Maye has been shot dead outside a mosque in the town of Baidoa, the seat of parliament. 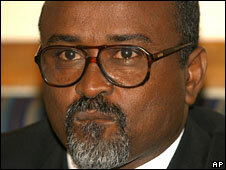 He was thought to have been an ally of President Abdullahi Yusuf. He is the first MP to have been assassinated since Ethiopian forces helped the interim government oust Islamists from power in December 2006. Meanwhile, Islamist militants who took over the port town of Kismayo last month have imposed a curfew following the assassination of several residents. “The curfew started on Monday night and will go on until we secure the town,” Abdurrahman Ali Mohamed, who is charge of security in the town, told BBC. Insurgents of the al-Shabab group seized control of Kismayo in August after a three-day battle in which an estimated 70 civilians were killed. Somalia’s third city, is strategically important because it serves as a port for the south of the country. He says it is the biggest city the Islamists have seized during their 20-month insurgency. Al-Shabab, a radical wing of the Union of Islamic Courts which ruled much of southern Somalia in 2006, has refused to participate in a UN-backed peace initiative taking place in Djibouti. Hundreds of thousands of people have been displaced in fighting which has been worst in the capital, Mogadishu. Earlier this week, Mr Maye gave a speech to parliament, expressing his concern about the worsening violence. “He was shot in the head outside a mosque where he had attended evening prayers,” MP Amir Shaketi told the AFP news agency. Somalia has been without a functioning national government since 1991 and has suffered ongoing civil strife. Canadian Prime Minister Stephen Harper has called an early election for 14 October in a bid to strengthen his minority Conservative government. He met Governor General Michaelle Jean – the representative of Canada’s head of state, Queen Elizabeth II – to request the dissolution of parliament. The latest polls indicate the Conservatives are ahead of the opposition Liberals. 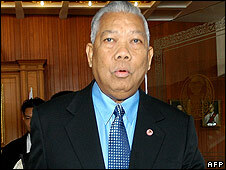 The PM, elected in 2006, has complained that parliament is deadlocked. The vote will be Canada’s third national election in four years. Mr Harper’s government has needed the support of the main opposition parties, the Liberals and the Bloc Quebecois, to pass legislation and adopt budgets. The election call had been widely expected, with Mr Harper complaining in recent weeks that parliament was “dysfunctional”. Holding the election this year breaks Mr Harper’s own fixed-date election law, something he had said was necessary to prevent prime ministers calling elections when polls indicated they were in a favorable position. Mr Harper has made it clear he is running on economic issues and criticized the Liberals’ plan to tax greenhouse gas polluters while cutting other taxes. “Between now and October 14, Canadians will choose a government to look out for their interests at a time of global economic trouble,” Mr Harper said in a statement. The opposition leaders are expected to make their own addresses later on Sunday. Mr Harper led the Conservatives to victory in the 2006 election, ending 12 years of Liberal government. The party heads into the election with 127 of parliament’s 308 seats. The Liberals have 95, the Bloc Quebecois has 48 and the New Democratic Party (NDP) 30. There are three Independent MPs, the Green Party has one seat and four are vacant. An opinion poll held last week suggested support for the Conservatives had grown over the summer. The Environics survey suggested that 38% of Canadians would vote for the Conservatives; 28% for the Liberals; 19% for the NDP, eight for the Bloc Quebecois and seven for the Greens. The figures put the Conservatives within striking distance of a majority government, Donna Dasko, senior vice-president of Environics Research Group, told CBC News. The leader of the separatist Bloc Quebecois, Gilles Duceppe, said his party was best positioned to stop the Conservatives gaining a majority. The same Environics poll indicated increased support for the Conservatives in Quebec, where separatist ardour has faded in recent years. 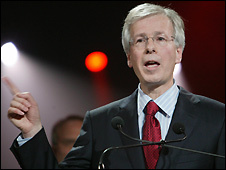 Liberal leader Stephane Dion is staking his command of the party on his “Green Shift” plan, which would tax polluters but reduce other taxes. If his party does not do well on 14 October, his leadership will likely come under scrutiny at a party convention in December. Mr Dion has described Mr Harper as Canada’s most right-wing prime minister in history. 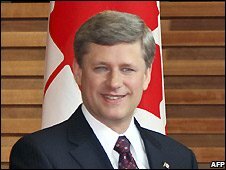 Mr Harper supported the Iraq war while in opposition and withdrew Canada from the Kyoto Protocol that aims to cut greenhouse gases. He has also increased Canada’s troop commitment to Afghanistan. 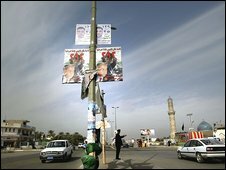 Voting has started in Pakistan to elect a successor to Pervez Musharraf, who resigned as president last month rather than risk impeachment. The winner is expected to be Asif Ali Zardari, the widower of assassinated former Prime Minister Benazir Bhutto. Voting is being held in both the national and provincial assemblies. The next president will have to tackle an Islamist insurgency and an economic crisis which are threatening the country’s stability. 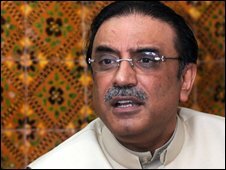 Mr Zardari was thrust into the center of political power by the killing of Ms Bhutto last December after which he became head of the Pakistan People’s Party (PPP). Mr Zardari is regarded by many as the de facto prime minister and he is now almost certain to become president. Our correspondent says that in recent months Mr Zardari has shown skill by forging a large coalition and using it to peacefully unseat the former military ruler, President Musharraf. Mr Zardari is one of Pakistan’s most controversial politicians. For years he has been hounded by allegations of massive corruption – although he has never been convicted. 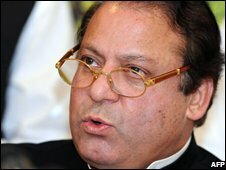 Former Prime Minister Nawaz Sharif took his PML-N party out of the governing coalition last week, accusing Mr Zardari of breaking key promises. Many in Pakistan fear the country is facing a return to an old-style politics of confrontation at a time when urgent action is needed to improve the economy and deal with a raging Islamist insurgency. Mr Zardari is seen as pro-Western and supportive of Washington’s self-declared war on terror. If he becomes president, he will have to juggle the demands of the United States, Pakistan’s powerful army, and strong anti-American sentiment in the country. Our correspondent says Mr Musharraf tried to do that and failed. She adds that Pakistanis hope that Asif Zardari will have more success, but they see little in his past to encourage them. The other candidates are Saeeduz Zaman Siddiqui, a former judge who has the backing of Mr Sharif, and Mushahid Hussain Sayed, who was nominated by the PML-Q party that supported Mr Musharraf. In the Islamabad parliament, members of the upper house, the Senate, are voting first, followed by the lower house. 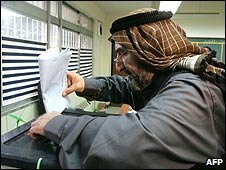 Voting is being held in a similar fashion in Pakistan’s four provincial assemblies of Sindh, Punjab, Baluchistan and the North-West Frontier Province. There is only one round of voting and whoever has most of the 702 votes wins. Results are expected late on Saturday.